Are you considering buying your own website business? With the advent of the Internet culture and e-commerce, website development has seen a tremendous growth. There are so many sites out there which have been built just right for you. A website opportunity to buy and operate can provide you with a tremendous amount of joy, financial freedom and free time for yourself and family.Just find the best suitable website for your interest and make an ENQUIRY to know more about. We offer to you fully developed website designs along with 1 year Web Hosting and Domain Names for sale. 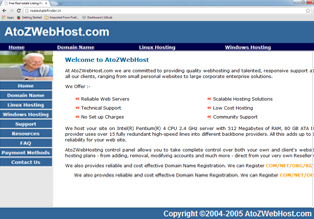 AtoZ WebHostcompany offers an innovative, market leading service to both domestic and corporate clients through its bespoke hosting platform. Mainstream services including Linux web hosting, windows web hosting, Reseller Hosting, and it also generates revenues from domain names. 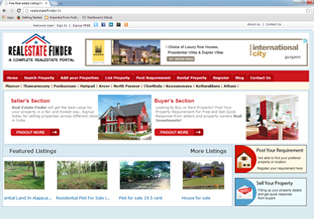 Realestatefinder.in is the India's number one dedicated property portal. With a focus on joining property seekers with agents & brokers, we provide buyers & renters with a comprehensive property search alongside tools and information - and provide real estate agents with the largest potential audience of house-hunters in the India. 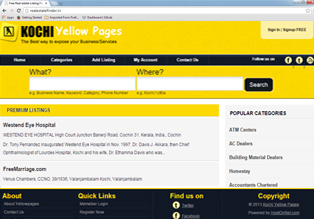 One of the largest online Yellow Pages and Business Directory listing company in Kerala based at Kochi, that has been helping small businesses grow and succeed for future market. Today's consumer has different options when looking for business information, and no single marketing solution will work. 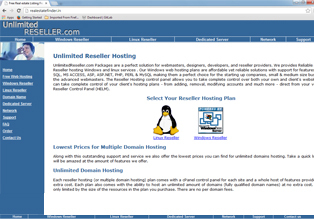 UnlimitedReseller.com Packages are a perfect solution for web-masters, designers, developers, and reseller providers. We provides Reliable & cheap Reseller hosting Windows and Linux services . Our Windows web hosting plans are affordable yet reliable solutions with support for features like MS SQL, MS ACCESS, ASP, ASP.NET, PHP, PERL & MySQL making them a perfect choice for the starting up companies, small & medium size business & the advanced web-masters.